Connecting on a whole new level: new Ethiopian immigrants, Jewish Agency participate in tree-planting ceremony in honor of Tu Bishvat. Over 450 new Ethiopian immigrants to Israel cemented their connection to the Land of Israel in a unique way Tuesday: by planting trees in honor of the holiday of Tu Bishvat. The immigrants have just arrived in Israel, and are living in absorption centers funded by the Jewish Agency. The Agency sponsored the event, along with the Jewish National Fund (JNF), the Ministry of Education, and the Ministry of Environmental Protection. "This is a holiday that represents both social justice and environmental justice. 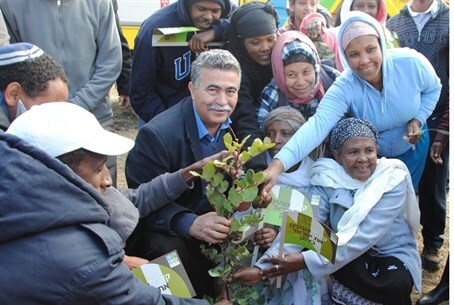 I am pleased to celebrate the holiday with members of the Ethiopian community who are setting down roots as an integral part of Israeli society," stated Minister of Environmental Protection Amir Peretz, present at the event. Tu Bishvat, the Mishnaic "New Year for the Trees," is customarily celebrated by planting trees and having a festive meal with new fruits. The event featured both the planting and a ceremonial meal in honor of the holiday.